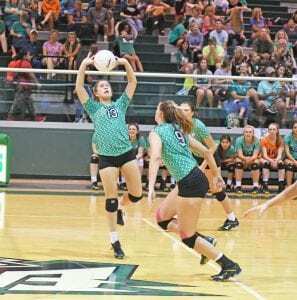 The Pleasanton volleyball team picked up a road win Tuesday night as its non-district schedule winds down. The Lady Eagles defeated Class 5A San Antonio Brackenridge 25-19, 25-13, 22-25, 25-23 to improve to 19-8 on the year. Pleasanton has two matches—Friday at Bandera and Tuesday at home versus San Antonio Burbank—before its District 30-4A opener at Beeville on Sept. 22. Amber Guerra (13) sets up a kill attempt by Kaycie Shannon. Senior Courtney Ridge led the Lady Eagles with 16 kills against Brackenridge. The outside hitter also added 15 digs and an ace. Kaycie Shannon contributed with 10 kills and four blocks, and fellow junior Laken McAda had nine kills and two blocks. Amber Guerra had a team-high 19 assists and tied Sarah Neill with 15 digs apiece. Senior Loryn Hardy had 14 digs. Pleasanton had a total of 11 blocks Tuesday, including three from Janessa Ximenez and two from Chloe Bryant.